This highly detailed Celtic short sword measures 18 1/2 in. overall and features a 13 in. satin finished stainless steel blade. The cast metal guard, pommel, and handle all offer a classic yet ornate look and feel. Includes matching scabbard. I got this for King Richards Faire in september to wear with my costume and I love it its gorgeously made and just love the feel of it in my hand. I wish it came with clips to put it on a belt or something like that but I'm making one. This dagger is awesome. Though it has a flat edge, it is more of a display or cosplay piece. It reminded me of the steel dagger from Skyrim with the accents on the guard. Amazing dagger, could not be happier!!! Nothing wrong at all about this! The details are beautiful, the gem well done, the scabbard, although plastic, is still amazing! Very dull, not sharp at all, so it's a great display piece. Very nice, especially for the price. The only downside is the bit of colored glass in the hilt-- at least on mine-- shows the glue very obviously & isn't very clear. It looks plastic, really. Enamel would look nicer, & I'll probably change it. I have to say for 10 bucks this knife is very well worth it. It came nice and tight. The end piece came off but i used some crazy glue and it holds fine. As a Irish historian and a practicing Druid i have to say this is one of the finest pieces I have seen that wasn't hand made. Very authentic you will enjoy it if you buy it which I strongly recommend doing. Enjoy and thanks budk! Are you kidding me? Ten bucks? What a buy! This dagger is for display, of course. It does not come with a sharpened edge whatsoever. (But, in this day and age of all the edges weapons you can use for defense, I hardly believe anyone would want to carry a ten dollar fantasy dagger in the first place.) 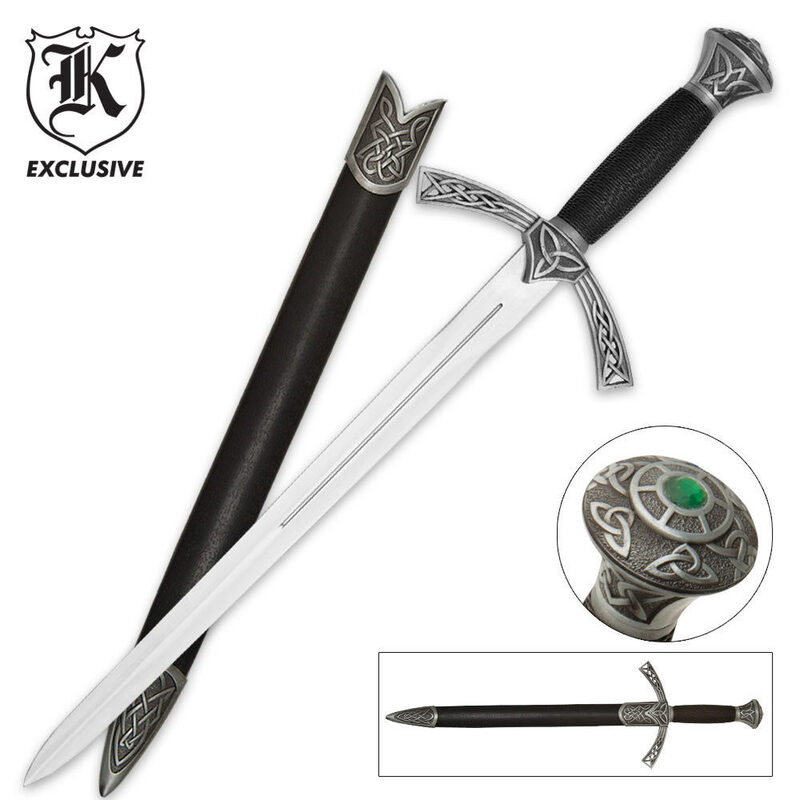 My daughter is all hot over this Lord Of The Rings phenom, and when she saw this dagger she lost it ... asking, "Can I have this when you die?" LOL! One tip for you: the pommel is not a single piece so if your dagger "rattles" simply screw in the end cap (which contains the green jewel) nice and tight. Problem solved. Terrific wall hanger. This is a blade that defines pure craftsmanship... the handle, hilt, and pommel are gorgeous and the amount of detail is astounding. in my opinion it is worth far more but i am glad that this is my first purchase. i will absolutely be acquiring new weapons for my collection. TrueSwords does a fantastic job. the blade is also very sturdy, and the scabbard is a tight fit, but not too tight. i have no complaints whatsoever!